RNT TOOL & DIE INC.
NIAGARA BP2-400-108-54 400 Ton Stamping Press, 108” x 54” Bed, 10” Stroke, 20 – 60 Strokes/min, 28” – 36” Shut Height, Omnilink 501 Control, Light Curtains, Chip Conveyor Recovery System, BWM Servo Feeder, 0.187 x 24” Material Cap. 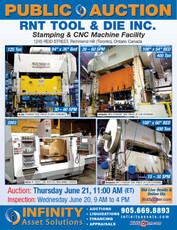 NIAGARA 400 Ton Stamping Press, 108” x 60” Bed, 14” Stroke, 15 – 30 Strokes/min, 19” – 33” Shut Height, Omnilink 5000 Control, Link Lite Black Max Light Curtains, BWM Servo Feeder, 0.187 x 31” Material Cap. BLOW 125 Ton Stamping Press, 84” x 36” Bed, 8” Stroke, 30 – 60 Strokes/min, 10” – 15-1/2” Shut Height, Pressmaster Control, Microguard Light Curtains, Servo Feeder, 0.125 x 12” Material Cap. CCI 65 Ton Stamping Press, 32” x 22” Bed, 5” Stroke, 90 – 120 Strokes/min, 7” – 10” Shut Height, Wintriss Control, Shadow II Light Curtains, 3” Ram Adjust, PA Industries Advantage Servo Roll Feel Control, Flodraulic Die Pro Control, 0.125 x 12” Material Cap. CCI 40 Ton Stamping Press, 28” x 19” Bed, 28-1/4” x 18-1/2” x 2” Bolster, 3” Stroke, 7” – 10” Shut Height, 2-1/2” Ram Adjust, 90 – 120 Strokes/min, Wintriss Control, Rapidair Feeder, 0.125 x 12” Material Cap. 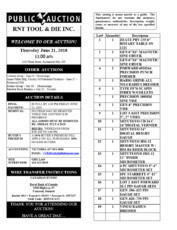 PLUS: Precision Tooling, Micrometers, Height Gauges, Verniers, Toolboxes, Saw Horses, Vises, Pallet & Die Racking, Power & Hand Tools, Work Benches, Pallet Jacks, Snowblower, Metal Inventory, CAT 40/50 Tooling & Tool Holders, Tool Holder Carts, Swivel Eye Bolts, Rigging Chains, Die Setup Blocks, Office Furniture and Much More!